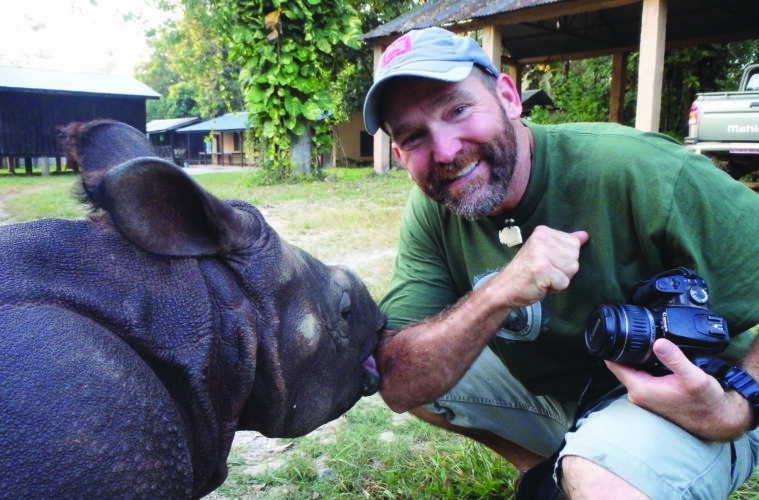 The rhino-loving zookeeper shares the big-horned love. Self-professed “animal nerd”Dave Johnson, 50, says elephants are his passion but he considers rhinos his family. In fact, Johnson makes a living as a Denver zookeeper and guardian of a 25-year-old endangered black rhinoceros named Rudy. Five times a month he travels into the community to teach Front Range youngsters about the natural world. The Littleton resident is author of three conservation books for children featuring Sissy Sally Sassafras, a Colorado girl determined to enlighten people about the plight of rhinos, elephants and other wildlife. Raised in Hot Springs, North Carolina, along the Appalachian Trail where he was a whitewater guide, Johnson leads conservation-minded adventurers on treks to Nepal, climbs mountains for rhinos, runs marathons for elephants and spreads his love for animals to support the Katie Adamson Conservation Fund (KatieAdamsonConservationFund.org) which he founded in 2014 to help promote endangered animal conservation initiatives. KACF is named for a Denver Zoo intern who passed away from cancer that year. His Zoodiac Kids program focuses on 12 major species, one for each month, including big cats, elephants, primates, frogs and sea turtles. Recipient of a conservation award in 2013 from the American Association of Zookeepers, he is involved in using beehives as a natural form of elephant fencing. “Kids look up to zookeepers. The job has changed dramatically. It’s not just picking up poop. You’re engaged with the audience. You’re planning conservation trips, letting people know how they can be involved, and not just as a passive participant on this planet. You can do things to make a difference,” he says. ELWAYVILLE: Forever Eco Wax For All Smart Shopping Editor’s Letter: Open Ground The December Issue is LIVE!